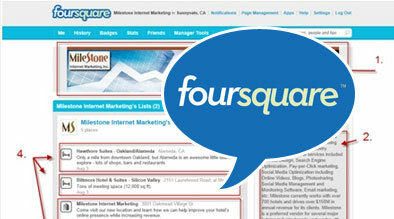 In the last couple of months, our social media team has noticed more and more clients asking about FourSquare. A lot of these requests are probably spurred by the recent Foursquare announcement in August allowing businesses to have their own branded pages to acquire followers, leave tips, and even check in places. 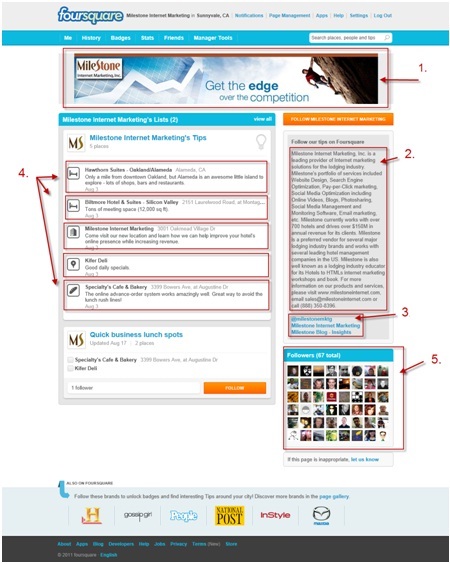 Tips left on other foursquare business pages – Foursquare users may socially discover your account when they read one of your public tips left about local restaurants, tourist attractions, etc. Switching gears from the custom business pages, let’s look at some actual engagement numbers. A TechCrunch article published in January of this year gave us some insight into Foursquare numbers. The article mentioned that Foursquare has grown 3,400 percent in terms of check-ins and has over 6 million users. These are pretty powerful numbers…but are people actually checking in to our client’s hotels? In both these scenarios, we see that daily check-ins have more than doubled year over year at both properties. When we looked at the overall trend for all our clients on Foursquare, we have seen the amount of daily check-ins has increased. With more and more users checking in on Foursquare, it is important to reward them with some sort of check-in special (like savings on a future booking, drink coupon, room upgrade, etc.). These users are already socially active, so if they obtain a great check-in deal, they are likely to share a link to your website through a tweet or Facebook post.